The 2013 Bathurst 12 Hour attracted the biggest field in history and also some of the biggest names in the world of motorsport. It is a fantastic event to be involved in and was certainly full of thrills and spills from beginning to end. Each year, when our team arrives into Bathurst we normally spend the Thursday completing the final preparation on the car, all the documentation and scrutineering checks before we hit the track for the first practise on Friday. This year was no different. 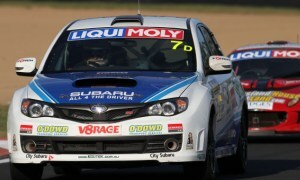 The guys did a great job and gave us the best STI that I have driven around Bathurst. The car was great from the first practice laps on Friday. I completed the first session, making sure that the car was set up correctly and didn’t require too many changes to accommodate the slick tyres we had to run. 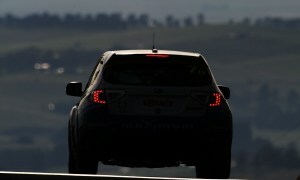 In actual fact, the Pirelli tyres coupled with the STI were a perfect match. We had no problems with the handling or feel of the car, which gave us extra time to gather data on the conditions and the wear rates of the tyres. 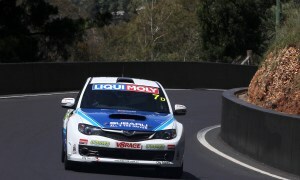 In my first practice we were able to pump out a sub 2 min 30 sec lap which would make it the fastest lap for a production based Subaru at Bathurst ever! This also meant we were the fastest Production Car of the day! With the car performing so strongly in the first practise we were able to get John O’Dowd and Angus Kennard in the car for the final two practice sessions so they could become comfortable. We also started to “road in” the new slick to get them ready for race day. All in all, it was a very successful first day on the track. Saturday is all about qualifying. There is one 90 minute session in the morning and a 30 minunte session in the afternoon. Our plan was to have all drivers run in the first session and then prep the car during the break so that we could use the shorter session as a run in for the car to start on Sunday. John and Angus ran first and both battled the traffic to post solid times. I ran late in the session and wasn’t quite able to get a clear lap to gain pole for production; we missed it by ½ a second! The team worked flat out to change many components during the break so we could shake the car down in the last session and make sure it was good to go on race day. Things like wheel hubs, bearings, brake rotors, pads, driveshafts, lubricants, etc. were all changed to make sure that the car was given the best chance to finish the 12 hours with no problems. Because we were to use the 30 minute session only as a shakedown and check, and I was the only driver out in this session, I was also to “road” another set of slick for Sunday. On the new tyres and brakes, the car felt fantastic and I knew that even with a full tank of fuel we could post the pole lap if we tried. I radioed the team and asked them if they wanted me to go for it. The reply was no, just run everything in and park it up. Which was the correct answer as we were aiming for No 1 on Sunday arvo not qualifying, but it is hard not to attack the track with a car that felt that good. So, really we had the best lead up you could ask for- everything was set and ready for 12 hours at the mountain. On race days it’s an early start for everyone. The team was at the track at 05:30 to get the car ready to start on the green flag at 7:00. John was elected to start the event for us–he did a great job and even avoided a tricky situation heading onto the Conrod Straight as there had been a multi car crash. The only damage was to both front and rear driver doors where a Ford pitched sideways into John. Luckily it was only cosmetic damage and the doors at least still opened during the subsequent pit stops. Angus was next in, followed by myself. All the pit stops were going well, the team was working well together and, of course, we were having no issues with the car. We were 2nd when Angus come in to hand over to me. During the stop we actually leapfrogged the BMW to lead of production, and a couple of laps later their engine expired and our main competitors were gone. We now had a 3 lap lead and things were looking good. After my first run, John and Angus continued with their stints and did a great job and producing consistent laps. The weather was expected to get worse later in the afternoon, so we decided to keep my hours down so that I could complete the majority of the wet running if the rain came. Angus completed a double stint and then John was back in the seat. Our lead grew to 5 laps in this time and all was going well until late into hour six. John was at the top of the mountain and came across a GTR with a puncture. With cars everywhere John had a Porsche make contact with him and turn him into the fence at 130kph. The resultant damage meant we were out. Fortunately, John was OK, despite the big impact. Obviously we are all disappointed that we weren’t able to take the win this year, however I am hugely proud of the whole team: John, Angus and particularly our Subaru STI, which punches above its weight and has a great amount of support at the Mountain. This entry was posted on Sunday, February 17th, 2013 at 8:34 pm.